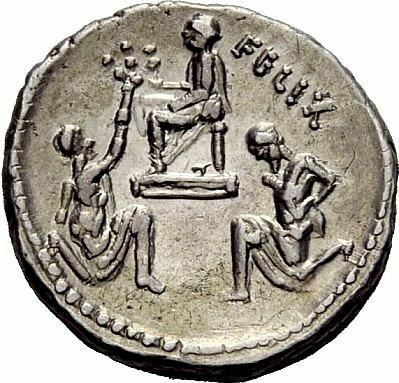 Faustus Cornelius Sulla was one of the moneyers for the year 56 BC. He was Quaestor in 54 B.
Faustus was the only surviving son of the Dictator of Rome Lucius Cornelius Sulla and his fourth wife Caecilia Metella, and thus a member of one of the most ancient patrician families, the Cornelii. After his father's death in 78 BC, he and his twin sister Fausta were brought up by his guardian, his father's friend Lucullus. Faustus married Pompeia, daughter of Pompey the Great, and accompanied Pompey on his Asian campaigns. He was the first to climb over the walls of the Temple of Jerusalem when it was stormed by Pompey in 63 BC. His career as was cut short, however, by the civil war between Pompey and Julius Caesar. He, as Lucullus' ward and Pompey's son-in-law, sided with the former. Faustus was at the Battle of Pharsalus in 48 BC, joining the leaders of his party in Africa subsequently. After the Battle of Thapsus, he tried to escape to Mauretania, but was caught and killed by Publius Sittius, a supporter of Caesar, in 46 BC.